Well hello little shrimp!! It’s been…awhile…since I’ve seen you guys in my kitchen, and I’ve missed you so!! You see, my friends, I found out recently that J is not a huge fan of shrimp if they “taste fishy.” He loves seafood, so it’s not an aversion to that, but I guess if they are prepared a certain way the flavor is off-putting to him. So sad, because I love, love, love shrimp. But, because I don’t share this taste of “fishy” shrimp, I’ve been avoiding them altogether. But, past experience has shown that if there is a sauce of some sort, it tends to be well-received. And he bought some shrimp recently to fish with and then didn’t use it, so I had a nice little bag in the freezer just begging to be cooked! I’ve had this recipe sitting on one of my Pinterest boards for quite some time, so I was excited for the chance to make it. When I first looked at the ingredients I was a little put-off as I don’t usually use bottled marinades or sauces, and then of course my grocery stored didn’t have the exact one that was used. Of course. But they did have one that was similar and I decided to give it a whirl. And it was delicious! 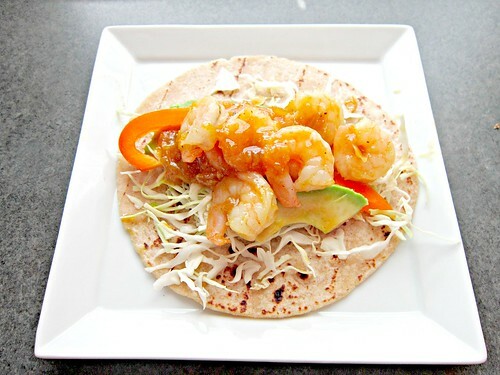 Delicious little shrimp, crispy coleslaw, red bell pepper strips, and creamy avocado all wrapped in a soft tortilla and coated in a sweet-spicy sauce. Yep, that’s one good taco y’all!! Oh, and did I mention you can have it on the table in about 15 minutes?!?!? I’d say that’s a pretty good weeknight dinner, wouldn’t you? Heat oil in a large, non-stick skillet over medium heat. Add shrimp in a single layer and cook for two minutes until pink. Stir or flip until cooked through, about 2-3 minutes. Cook in batches if necessary. Stir in 1 cup of the Garlic Rosemary & Citrus Sauce and warm through. Remove from heat. 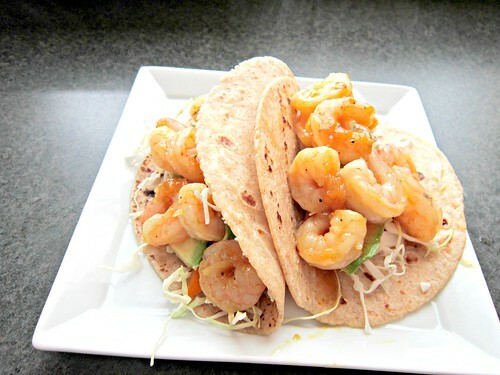 Warm tortillas and top with coleslaw, a couple of pepper strips, a couple (or more) avocado slices, and shrimp. Serve with additional sauce on the side, if you like. I so wish seafood could be a part of my life. Alas, allergies prevent it. I GUESS I could make this for the husband. And he took out the trash or something.